Chickens are having a moment in American gardening. Whether people keep them for eggs or meat, because chickens fulfill a dream of self-sufficiency, or because they’ve cute and make amusing (if labor-intensive) pets, from coast to coast, chickens are in backyards to stay. But can a garden—especially a tempting vegetable garden—peacefully coexist with hungry, inquisitive chickens, with their potential to eat tender seedlings, and shred plants with their scratching? 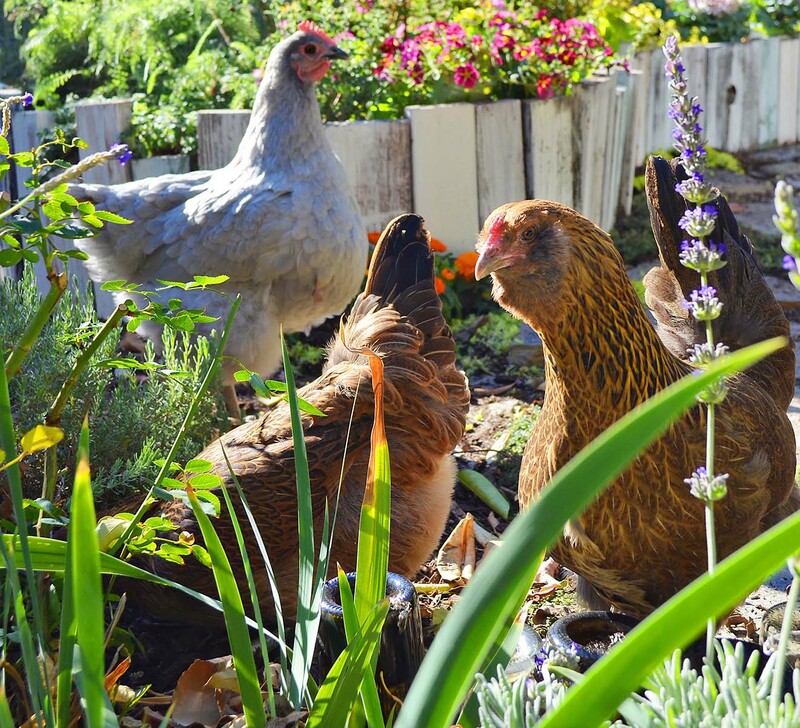 It’s a smart subject for a book, and the answer, says Gardening With Chickens author Lisa Steele, is that they can not only coexist, but each can benefit the other. In this latest book, Steele answers the questions that come up when considering allowing chickens in the garden: how to keep them from eating or uprooting plants and when to put them on bug patrol. There’s growing information for plants to feed chickens for their health and well being as well as for better quality and more nutritious eggs (and to save money on feed). There are also lists of plants—both vegetables and ornamentals—to avoid feeding chickens: asparagus, which can give eggs a funny taste, plants from the nightshade family, such as tomatoes and eggplant, which can make chickens very sick, and plants that are toxic to most living creatures when ingested, such as oleander, monkshood, and daffodils. And of course, there are lots of color photos of hens doing their thing: scratching, eating, dust bathing, and otherwise strutting their stuff. There are photos and illustrations, too, of plants and garden plans. Steele has a girlfriend-y, down-to-earth writing voice that is an easy and entertaining read, even if you don’t have chickens, as I do not. I learned that eating parsley gives eggs bright orange yolks. Adding herbs to nesting boxes can repel insects and rodents. There’s even a plan for a nesting box herb garden. The book seems to presume that the reader knows less about gardening than about chicken keeping. There’s basic info about starting a garden: siting, light requirements, soil types, which seems most gardeners considering chickens would already know. And there’s little about the nuts and bolts of keeping chickens. Many people have gardens, but no chickens, but it’s a safe bet that if you have chickens, you are already gardening. This book’s appeal may best be to chicken owners who are novice gardeners. Steele told me that she’s considering adding some basic chicken keeping info to the next edition of the book. If you’re considering adding chickens to your garden, Gardening With Chickens will tell you how, while keeping both it and the hens healthy, safe, and productive. And for in-depth chicken keeping info, you can always check out Steele’s book, Fresh Eggs Daily, or her website, Fresh Eggs Daily.com.